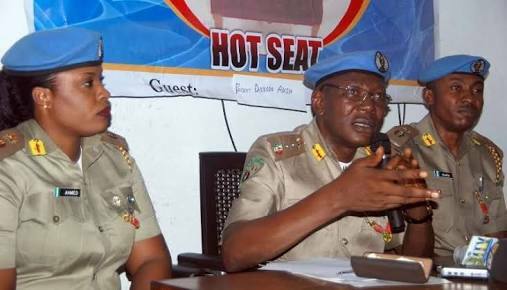 The Peace Corps of Nigeria (PCN) has pleaded with President Muhammadu Buhari to prevail on the Inspector-General of Police (IGP), Ibrahim Idris, to unseal its corporate headquarters following several court orders to that effect. It claimed to have secured over 15 valid court judgments against the police and other security agencies, none of which has been obeyed. National headquarters of Peace Corps of Nigeria at 57, Iya Abubakar crescent off Alex Ekwueme Street, opposite Jabi Lake, Jabi, Abuja, has been under lock and keys by the Police since February 28th, 2017, a day it officially opened. National Commandant of Peace Corps, Dickson Akoh, claimed the organisation pays as much as N13.5m rent annually on the sealed office. But the Police have refused to vacate the properties despite two subsisting court orders; resolution of the House of Representatives; the letter of authority from the Attorney-General of the Federation; the interventions from the Civil Society Organisations and National Human Rights Commission. Last Tuesday, Justice John Tsoho of the Federal High Court Abuja restrained the Police and Idris from further harassing Akoh or prosecuting him on any ground until all previous court judgments are obeyed. Briefing newsmen on the judgment, Akoh said his group remains a non-confrontational and law abiding organization and has explored all lawful means, including seeking political solutions to its ordeal but to no avail.